This page is going to be my tribute to David Bowie. I'd like to share some of the pictures I have collected over the years. Of course they are all in print in publications of one sort or another, many you may have seen, but, since I just got this scanner........well, of course I want to play with it. Click on the Photo to Enter. e mail me words of encouragement!!!!! This one is from an unknown magazine. 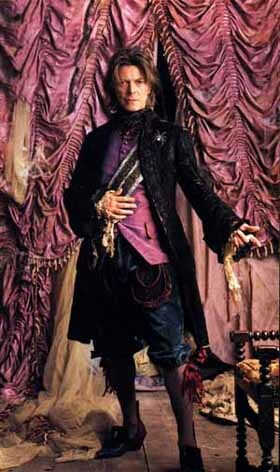 It is Mr. Bowie, dressed as Mephistopheles, from Gounod's opera Faust for MTV's Night at the Opera.